With Total Call Recorder, you can simply record any or all your desired phone calls. Have built-in audio player, to play recorded files. It support greater number of devices. With TCR you can even save your recordings on cloud. Provides the privilege to decide which call to record. Application has a simple, well organized, recording list and helps distinguish between received and dialled calls. You can also add desired Title and Description for your recorded calls. Even decide whether to record or not while receiving or dialling a phone call. 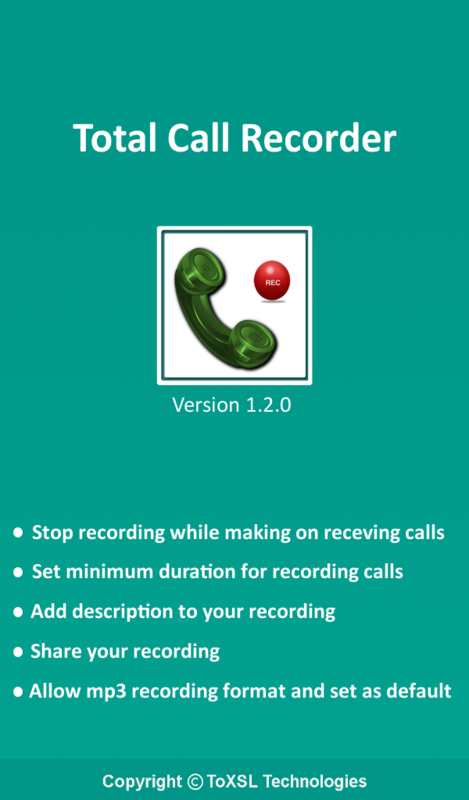 This is a user friendly, easy to use, voice call recording android application. You can save, share or even add your desired description for your recorded calls. 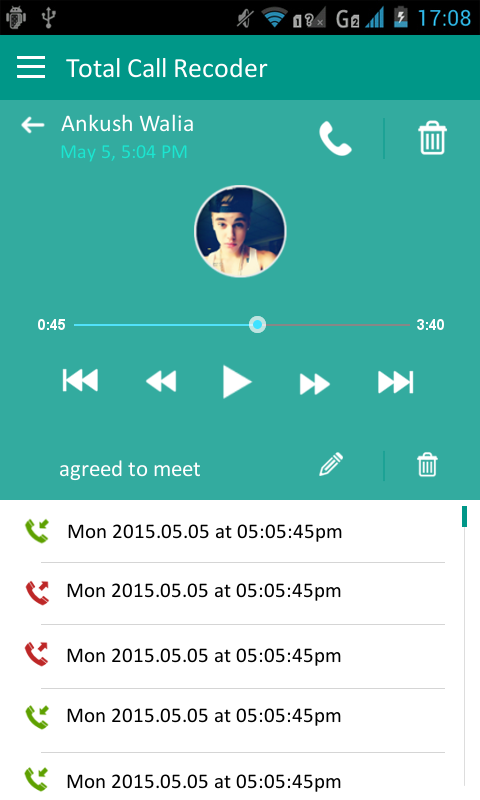 Recording and managing phone calls is much easier with this application. The Best VOICE CALL recording feature-packed application, that lets you record, save, share, upload and much more with any phone call you wish to. 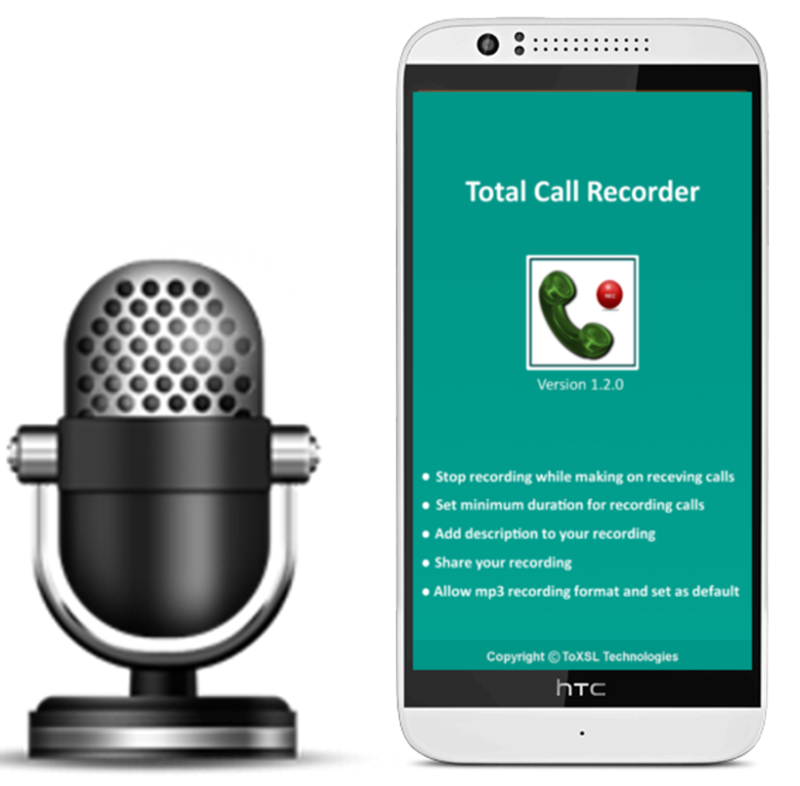 The Total Call Recorder is an android application that automatically record all your phone calls. Please do use our free version before purchasing the Pro Version. This application works perfectly on majority of devices. NEWAdd Title, Description to your recording. NEWStop the recording during the call with just one click. NEWChoose the direction of the call to record. NEWYou can set the minimum time limit to record the call. NEWGives you the privilege to remove the ads by switching to Pro version. The Best VOICE CALL recording feature-packed application, that lets you record any phone call you choose in format you wish to “FOR FREE”!! Listen to the recording or share it with your friends!! The default storage location for all calls is ‘External SD Card’, so the size of your recordings is not just limited to your phone memory. It gives the privilege to decide which call to record and which not to, at your own convenience, you can set the recording for only unknown numbers. Now, share your recordings, with anyone anywhere! Total Call Recorder provides an option to share recordings with friends through, Bluetooth, Gmail, message and leading messengers. Save your recordings on cloud!. Total Call Recorder gives you the functionality to backup your recordings on cloud services like Drop box and Google Drive. App may not function if other call recording applications are in use. Please close or delete ( uninstall ) all other recording apps. App may not function properly if the cellphone model you are using does not support the call recording function, and can only be used if custom ROM is installed. This is Paid version of popular Total Call Recorder Application with added features. Please download the Pro version only if free version works for your mobile. 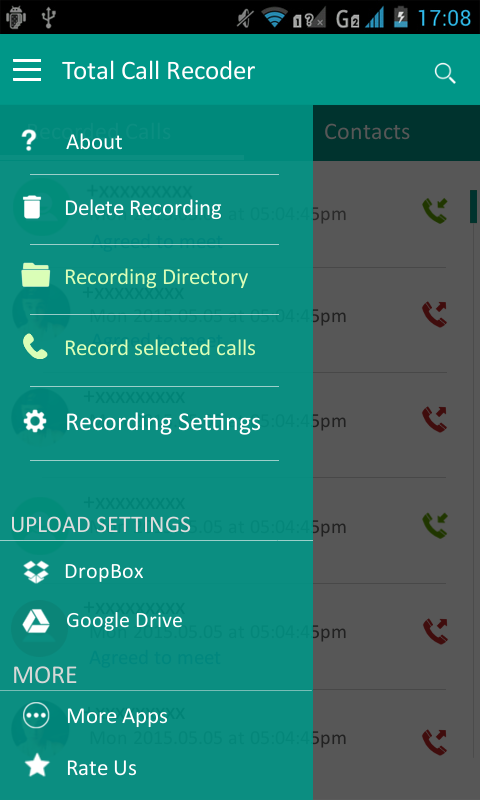 The Best VOICE CALL recording feature-packed android application, that lets you record any phone call you want to save. Choose which call to record and which not to using RECORDING CONTACT LIST. Listen to the recording, add notes or share it with your friends!! . The default storage destination of all calls is ‘External SD Card’, But you can always change to new location if you wish to. You can create save the recordings on cloud services. Enjoy the privilege to decide which call to record and which not to, at your own convenience. 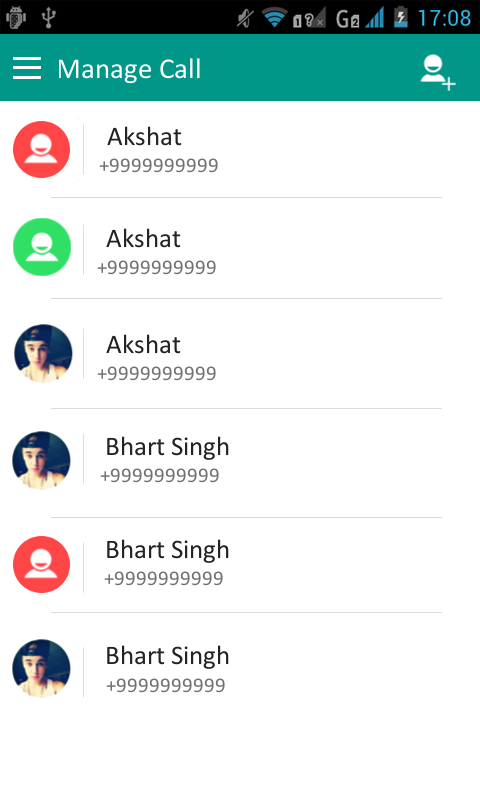 You can even set to record only unknown numbers. The Total Call Recorder gives us the privilege to record the call according to direction e. g. Incoming, Outgoing or Both. Now, share your recordings, with anyone anywhere! 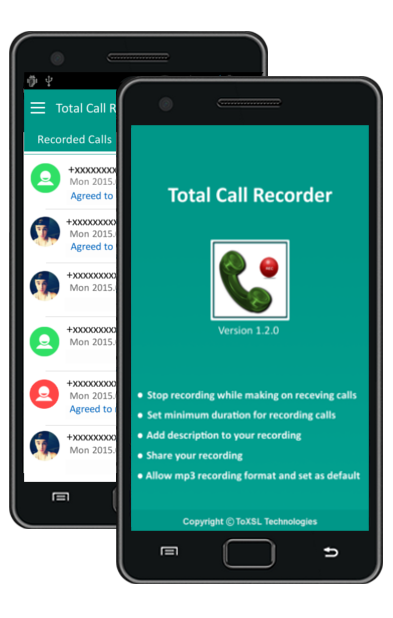 Total Call Recorder provides an option to share recordings with friends through, Bluetooth, Gmail, message and leading messengers. The default storage memory for all your recordings is now your SD card, so limited phone memory is no longer a limitation. Change the storage location according to your wish. This Voice call recording application has a simple, well organized, recording list and helps distinguish between received and dialled calls. You can add desired notes for the recorded calls. Deleting unwanted recordings could never be simpler! Total Call Recorder, provides an easy delete option, that lets user, easily delete all unwanted recordings. Built-in audio player, to play recorded files. It help supporting greater number of devices. Don't want to record the call, it gives you the privilege to cancel the recording with single click. For this just click on the Red icon on title bar during the call. When you forget something after a call, when a problem comes up, when it would have been great to be able to record that important phone call... this is what you'll be able to experience. Many phones include a call recording feature, but it's difficult to predict if a certain call may become important, making it difficult to record those important calls. With Total Call Recorder, you can automatically record any call and manage your recordings, meaning you can listen to previous calls again in order to relive memories or go over a conversation. Caution : If another recording app is in use, operation will fail. Please stop or delete other recording apps. - On the Nexus series and some overseas models' manufacturer chipsets, the recording function may not be available (installing a custom rom on these phones may enable the feature).